Based on this image of the 1828 Ware-Donaldson suit, I’m beginning to believe Joyce Smelley Odom that my Benjamin II did NOT marry Elizabeth Donaldson. 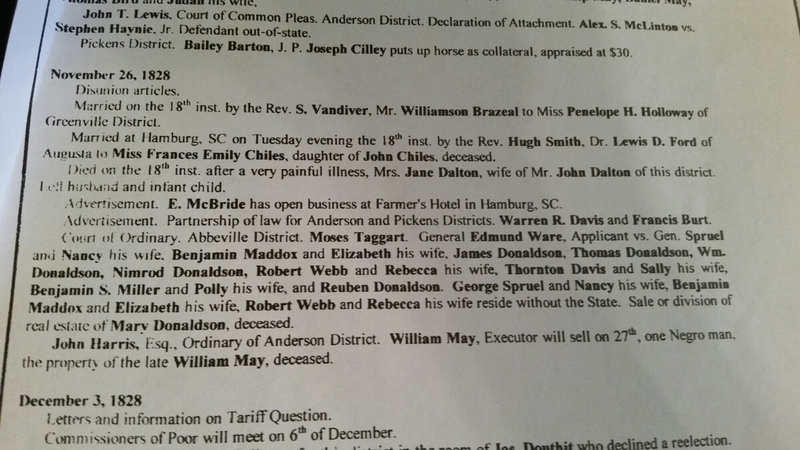 My Benjamin II was certainly married to an Elizabeth (she released her dower rights to the deceased Benjamin II’s property in August 1811); however, the 1828 Ware-Donaldson suit clearly shows a Benjamin married to Elizabeth Donaldson, living outside of SC. Joyce Smelley Odom claims that this Benjamin and Elizabeth were in Alabama by 1828. I believe that this SC-AL Benjamin is the son of William Maddox (William was the son of Benjamin II and brother of Benjamin III), since William Maddox’s Tuscaloosa will lists Benjamin as a son. There were at least three Benjamin Maddoxes in Abbeville/Laurens in the early 1800s… see my assessment at http://hisxmark.com/2012/08/09/lots-o-benjamins-17/ and Odom’s assessment at https://hisxmark.files.wordpress.com/2012/08/joyce-odoms-abbeville-maddox-narrative.pdf. They’re mutually compatible. Interesting. I read Joyce’s comments on your site. I read your site frequently. We will get these families untangled one day. Thank you for commenting. I don’t dislike your comment by the way. Previous Previous post: Ran into a brickwall…. Next Next post: Did I find…..